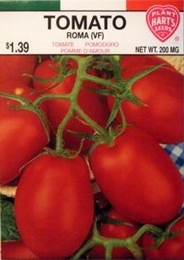 This variety is one of the most popular for whole canning, tomato paste and puree. Fruits approximately 3 1/2" long x 1 1/2" borne in clusters. Mild flavor and little juice. Resistant to Fusarium Wilt and Verticillium. This variety is sometimes known as Italian Canner.